Great conditions on the Isle of Skye gave us an opportunity to hone skills with this incredible back drop. 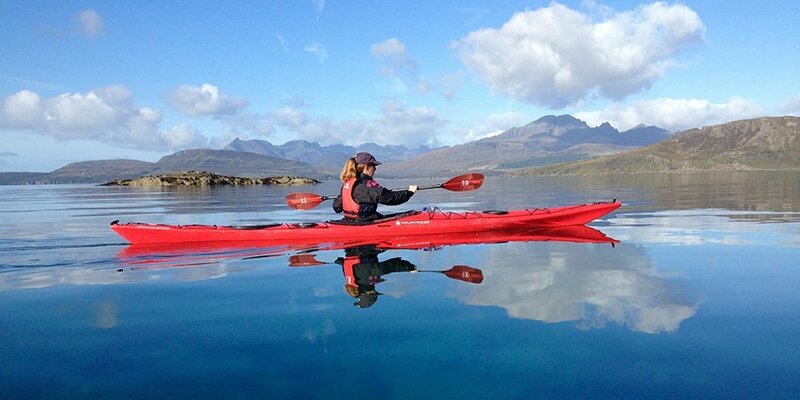 Paddling from Elgol on the Isle of Skye into Loch Scavaig and the heart of the Cuillin Mountains. One of the most spectacular paddles in the world. Great work by Kirsten who’s really improved her forward paddling technique. Super confident and relaxed and loving the water. On a hot sunny day the water is very inviting! An invigorating swim at lunch time in crystal clear waters. The light in northern Scotland is simply magical. The air and water are so clear and unpolluted which gives the most amazing vivid colours. Even this photo doesn’t really do it justice. It’s not often the conditions at St Kilda are this calm. 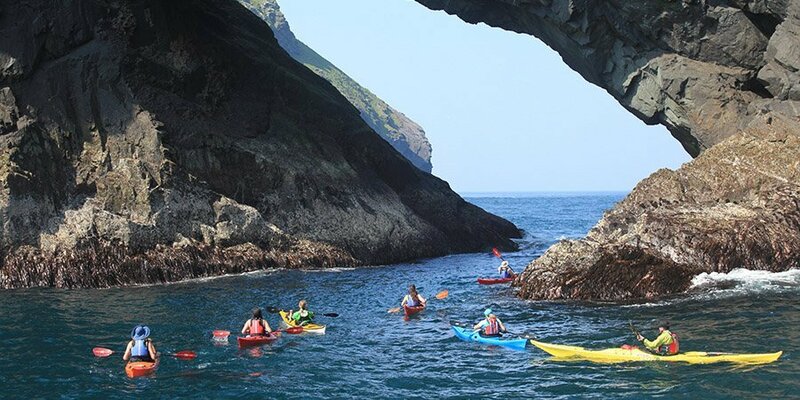 But when it is, then we are privileged to venture around the island and paddle beneath the soaring cliffs. 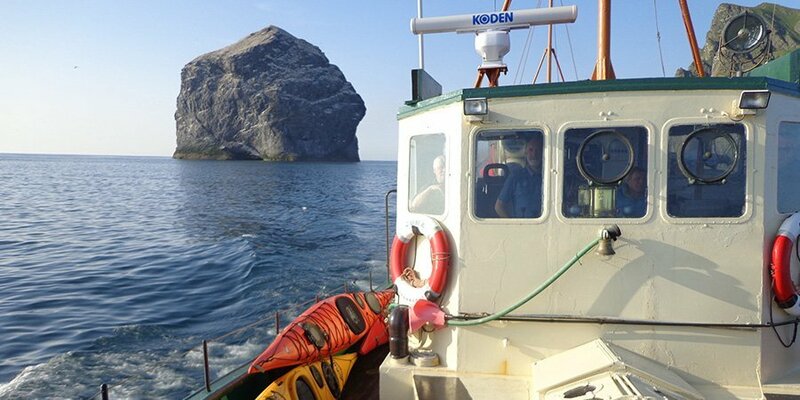 Here we are almost half way round the island having just paddled through the narrow gap between Mina Stac and St Kilda. In the distance and off to the left is Boreray. 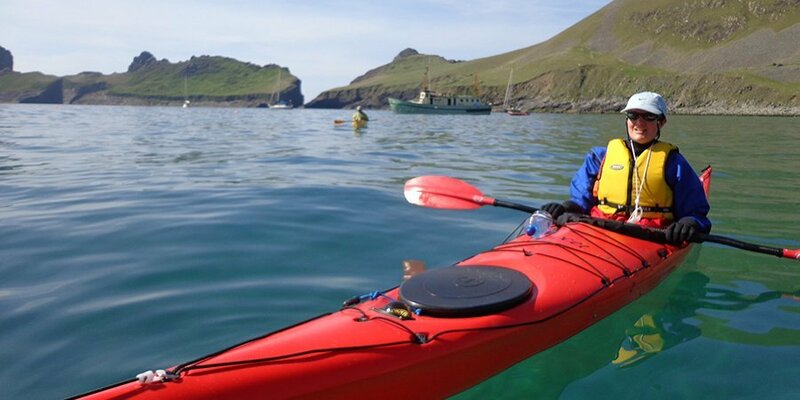 If the conditions are favourable, another highlight of the St Kilda Expedition is to paddle the open crossing from Village Bay at St Kilda to Boreray and its sea stacks. These sea stacks are the some of the highest in Europe and form the nesting ground for the largest colony of gannets in the north Atlantic. 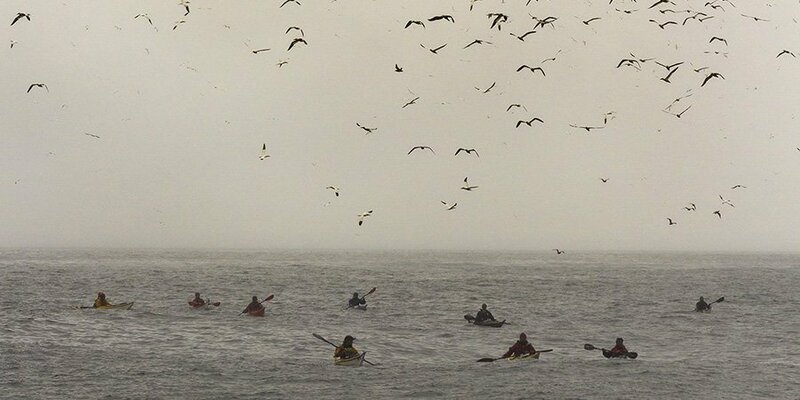 We’re met by gannets circling the kayaks, so many they seem more like a swarm of insects. 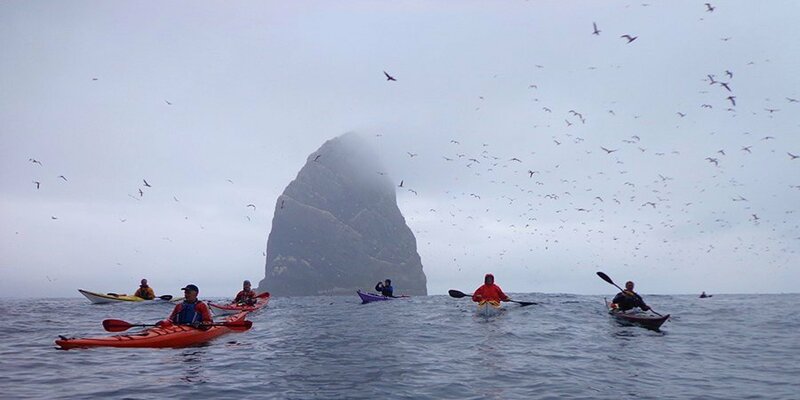 As we paddle across to Boreray and the Stacs from St Kilda, our first sign that we’re getting close is the welcome party of gannets. Thousands fill the sky and circle overhead until we leave. 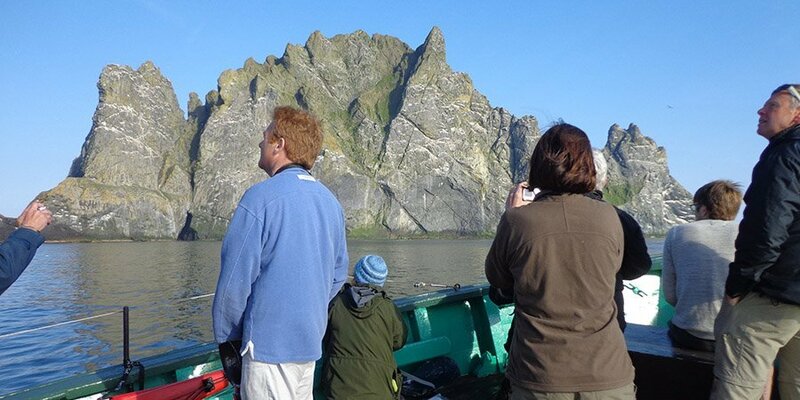 These sleek and powerful birds favour Boreray’s sea stacks as their nesting ground. When St Kilda was inhabited, its people hunted the birds and gathered their eggs forming the staple of their diet. Leaving St Kilda is as amazing as the arrival. 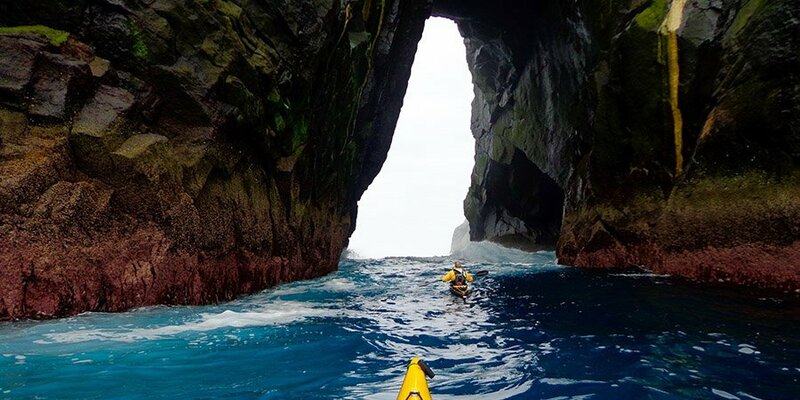 We’ve paddled its coastline tucked in underneath towering cliffs; poked our kayaks into the deepest and darkest of caves; and explored the island on foot to discover more about the people who once lived there. 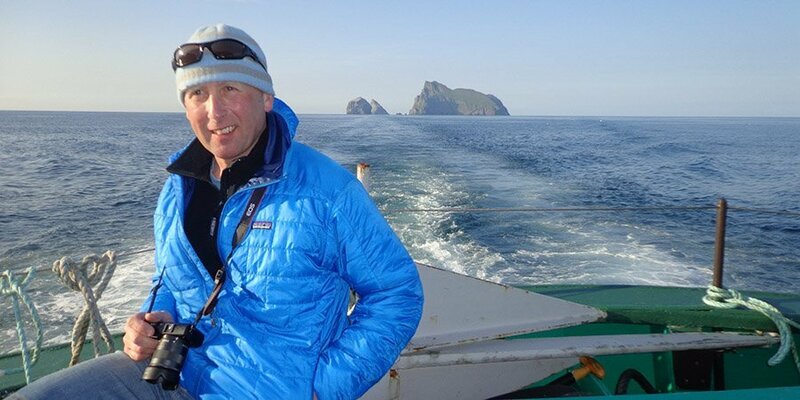 As we cruise back to Hebrides we’re once again reminded of the remoteness of these islands and how lucky we are to have had the opportunity to visit them. Having just made the 40 mile crossing from Lewis in our charter boat, we first arrive at Boreray. You could be mistaken thinking that this is wintry picture with snow lacing the island’s rocky ledges. In fact it’s guano accumulated from the thousands of birds that nest here every year. 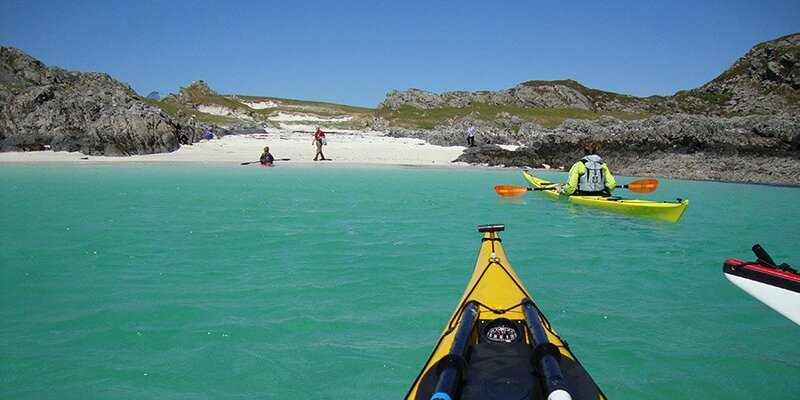 Everyone is awe struck as our first introduction to these amazing islands is Boreray. Conditions are sublime and we’ve been able to make the 40 mile crossing direct from Uig on Lewis. Boreray resembles a prehistoric landscape. The sharp edges of this volcanic island haven’t been smoothed by glaciation. It’s hard to imagine that these raw and rugged islands are part of the British Isles. If you pick the time of year right (which we always aim to do!) you can experience weather and conditions which make almost anything possible. 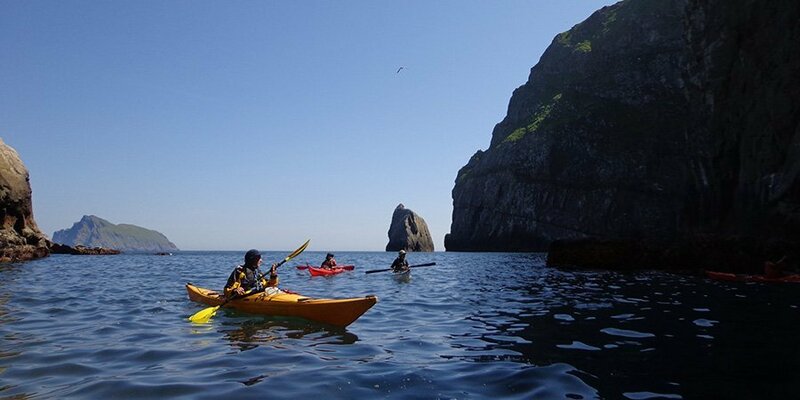 It’s a rare occurrence to be able to paddle at St Kilda without thermals and paddling cagoules! 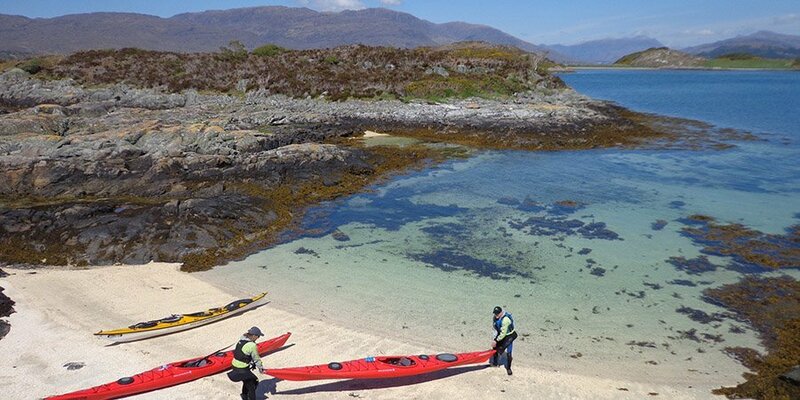 Having already completed a circumnavigation of the island the day before, we’re being ferried across to our kayaks which were left by the pier in Village Bay. 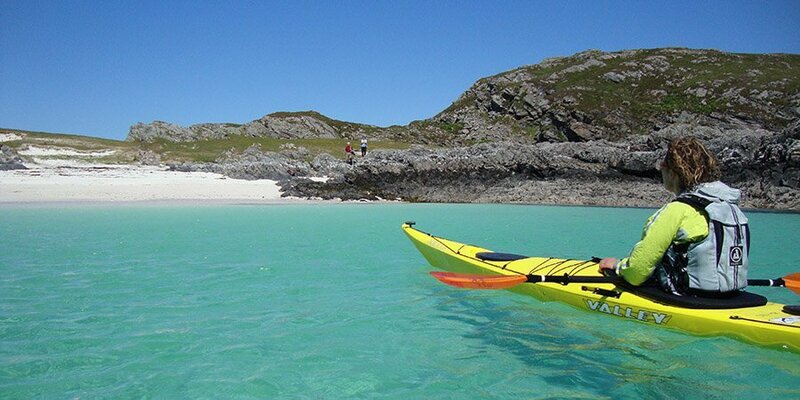 Today we’re kayaking to Boreray! Arriving back in Village Bay having just completed a circumnavigation of St Kilda. The conditions on the south-west facing side of the islands were a little lumpy with swell, as this side of island is completely exposed to the prevailing weather and swell which comes in from the Atlantic. 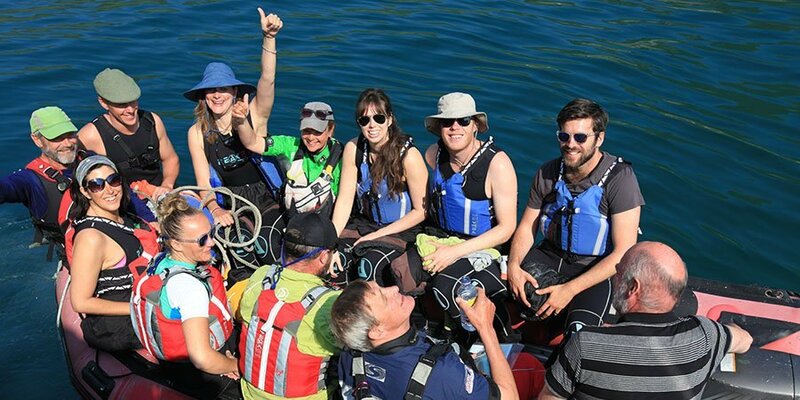 As we paddle through the Dun Gap the group is happy, relaxed and content in the knowledge of what they have just achieved. En route to St Kilda, we cruise past Boreray and Stac an Armin. A dozen kayaks are lashed onto the deck and we’re raring to go. We’re a quarter of our way around St Kilda. Looking back we spot our charter boat dwarfed by Mina Stac and smaller still when compared to the vertical cliffs of the main island. She’s a welcome sight coming to meet us as we know that going back on board will be our only way to comfortably stop during our circumnavigation. 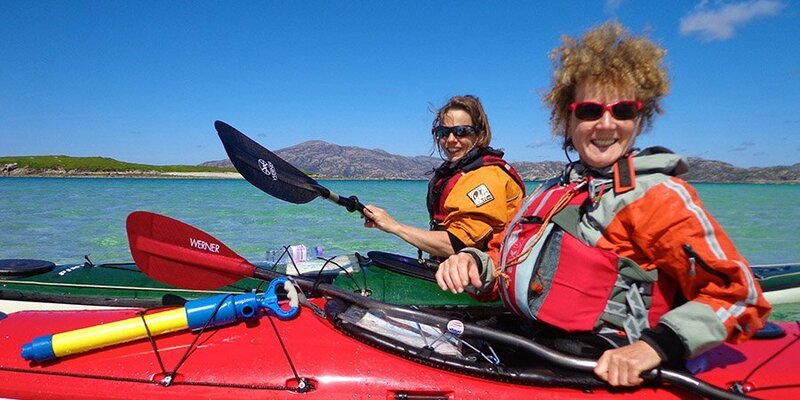 Happy to be in our kayaks after the long crossing to St Kilda. Conditions are vey calm and everyone is excited about paddling around the island. Some yachts have also taken advantage of the break in the weather and the day trip boats will be arriving shortly. 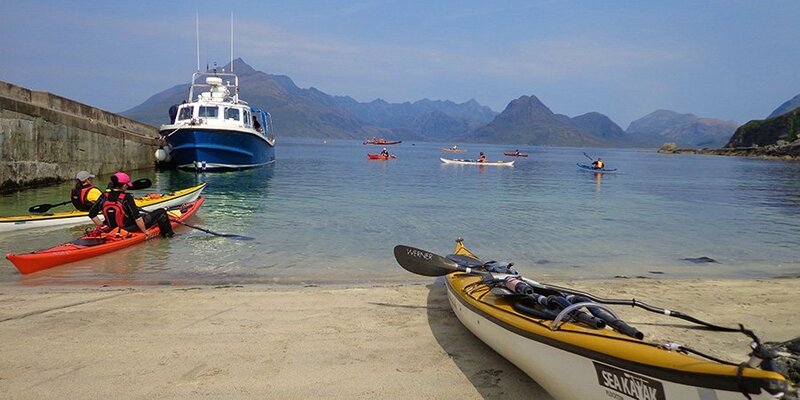 Our kayakers are smug in the knowledge we will be moored here for at least another 2 nights to soak up the atmosphere and majesty of the islands. 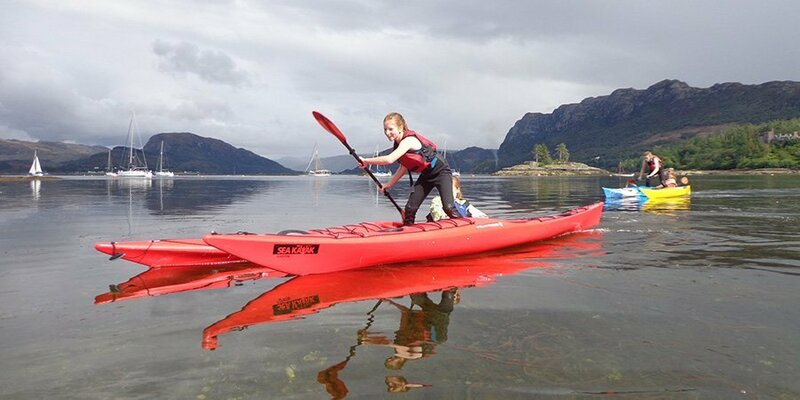 Toby loving his kayak and making the most of his St Kilda adventure with his group of friends. 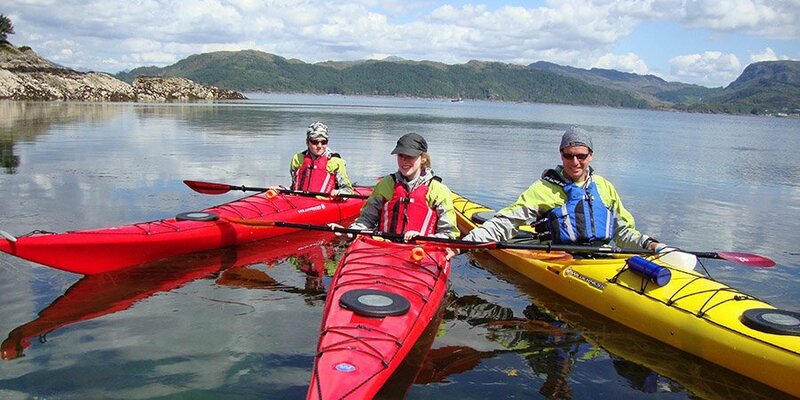 The expedition suits paddlers joining the trip on their own, in couples, or in a group. The social side is an important part of the adventure: great times are had and strong friendships form. 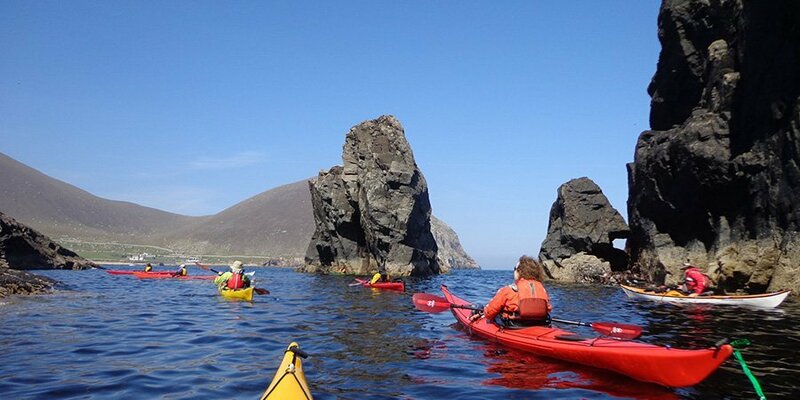 One of the highlights on a St Kilda circumnavigation is to paddle through the Soay arch. 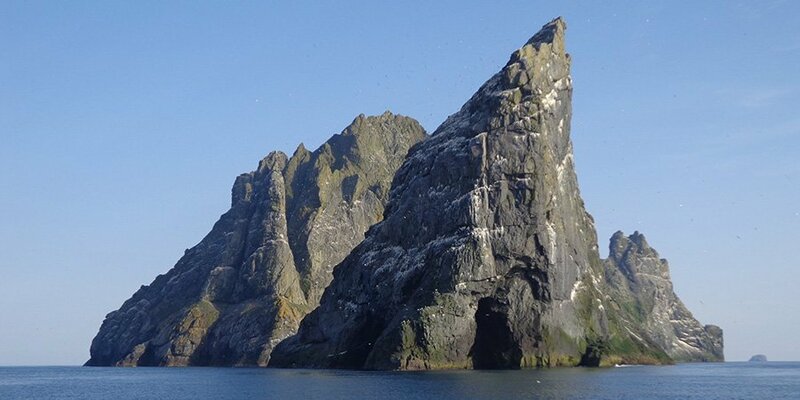 Soay is a smaller island to the north-west of St Kilda, only separated from the main island by a half kilometre channel. 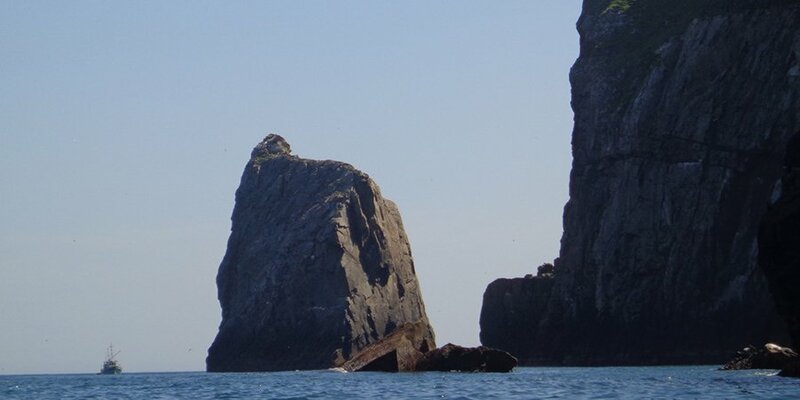 In the middle of the channel is the imposing Stac Shoaigh with its huge arch. Conditions are rarely calm here as the narrow channels and strong tides create some interesting water … even on good weather days. It’s an exhilarating spot and never fails to impress. The Monach Isles lie west of North Uist in the Outer Hebrides. The islands are low lying and sandy. They are a national nature reserve for the undisturbed machair and their grey seal population. 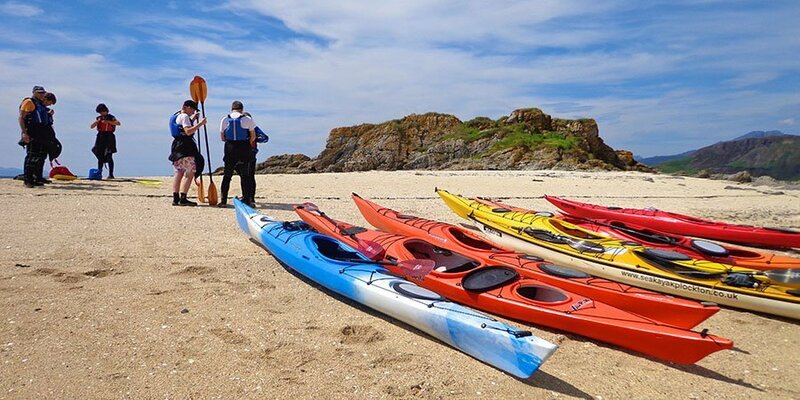 These are beautiful islands to paddle at and a chance for gentle walks among the marram grass and sand dunes. 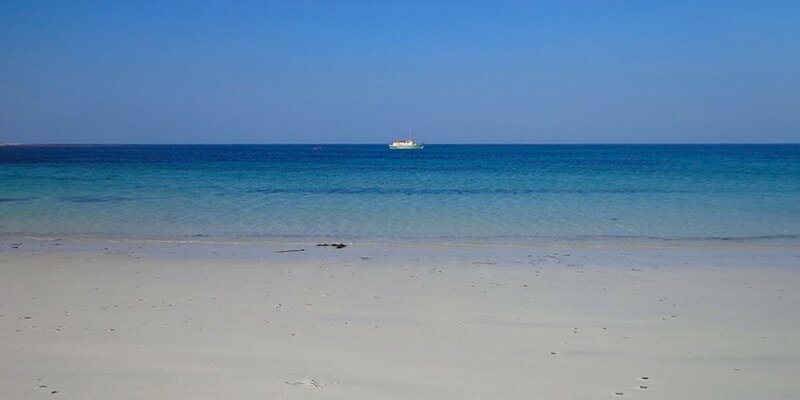 The Outer Hebrides are unbeatable in sunshine! 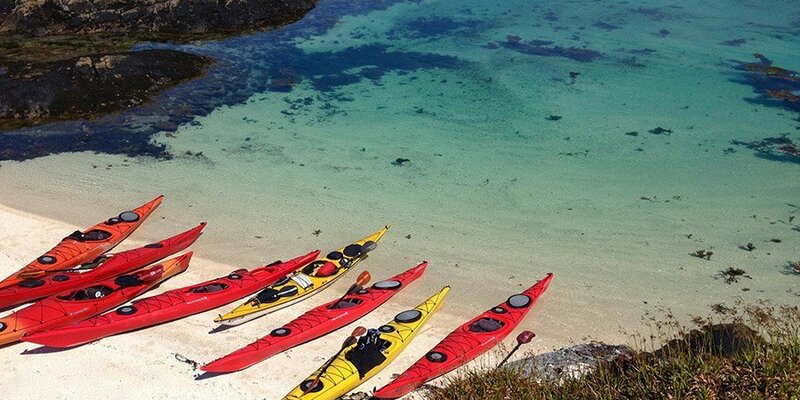 And this is the stuff of sea kayaking dreams. Stopping for lunch on the east facing side of Scarp, looking across to Hushinish on Harris. 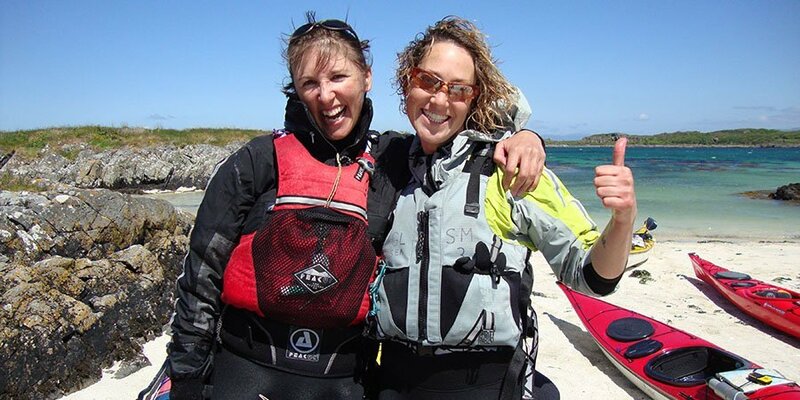 Very big smiles after an amazing Outer Hebrides Expedition. 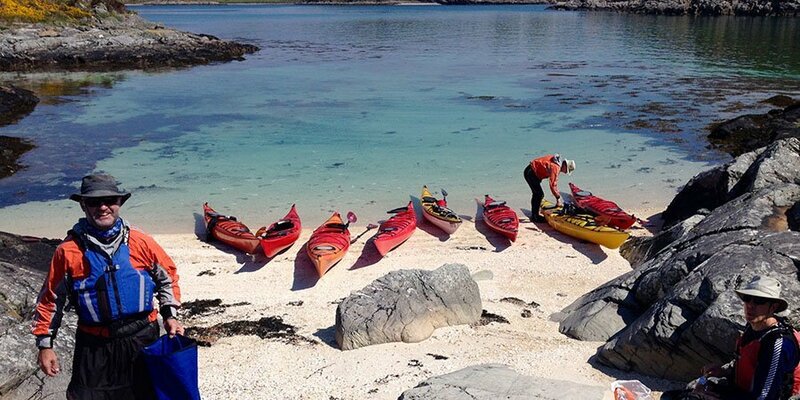 We finished the week paddling at the island of Scarp on the west coast of Harris. Shallow water, white sand and crystal clear water, a perfect end to the trip. It makes us very happy to see our clients so happy! 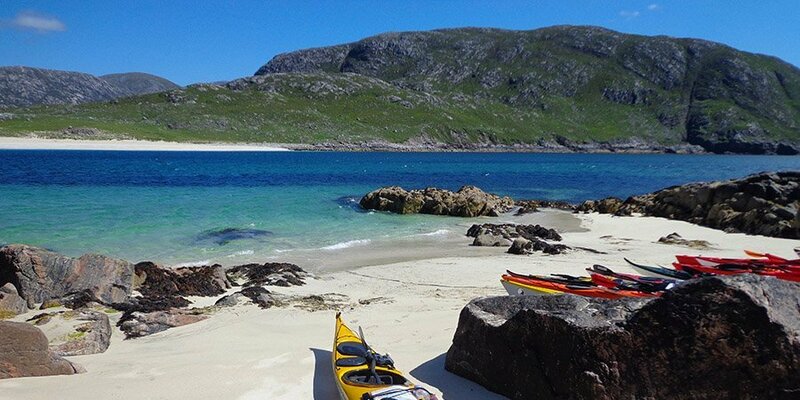 What’s not to like when the weather is this great, the company is just right, and you’re kayaking in the north-west Highlands of Scotland. 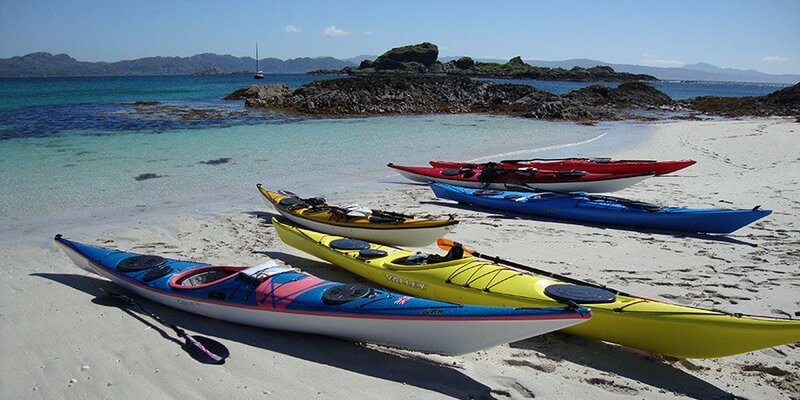 A glorious expedition where we started on the Isle of Skye and headed south to Arisaig and it’s collections of perfectly formed sandy beaches. Conditions were just right, enabling all our paddlers to really develop and improve their skills. 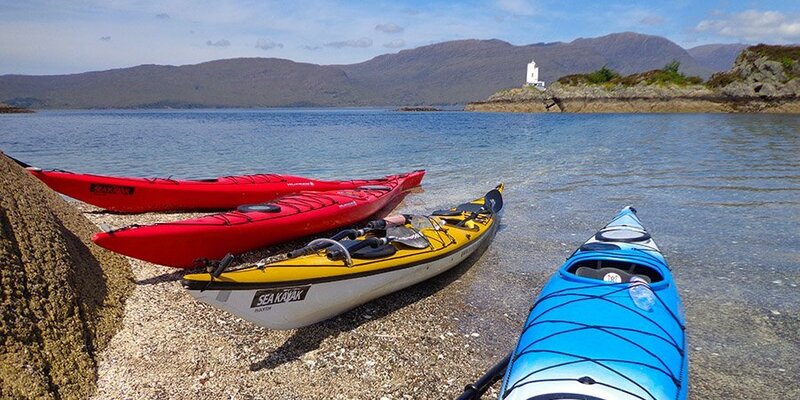 Our Isle of Skye Expeditions are a great way to not only discover the amazing rugged coastline of this famous island, but also learn and improve on boat packing skills! 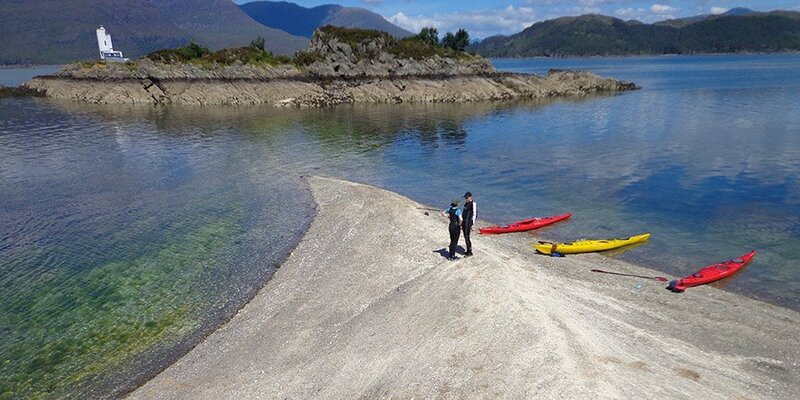 Like Plockton, there are secret spots on the Isle of Skye where you can discover these tiny coral beaches nestled on little islands. 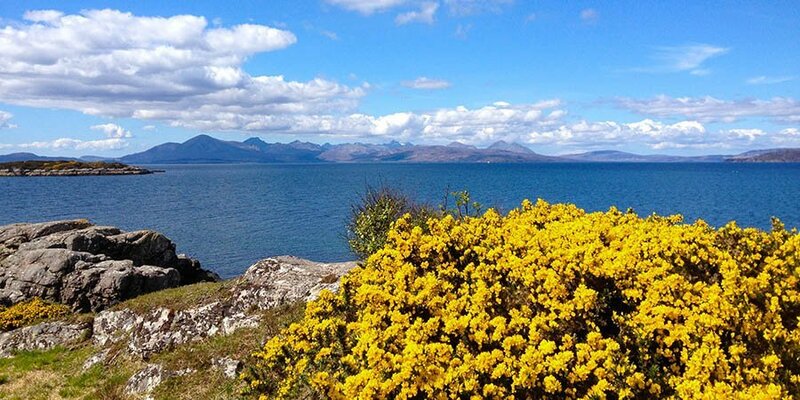 Beautiful views of the Isle of Skye from the crofting township of Drumbuie. We took a wee walk to let our paddlers stretch their legs. It looks stunning whether you’re on foot or on the water. 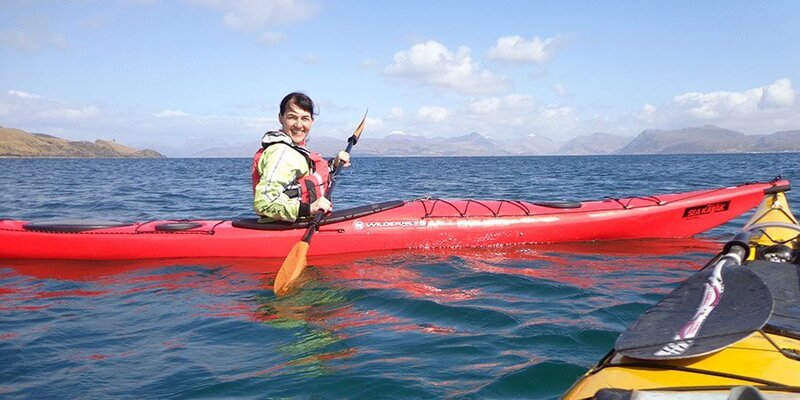 A glorious day on the Isle of Skye, and perfect conditions for our paddlers to improve and hone their skills. The south-west corner of Skye is more exposed to the wind and weather. 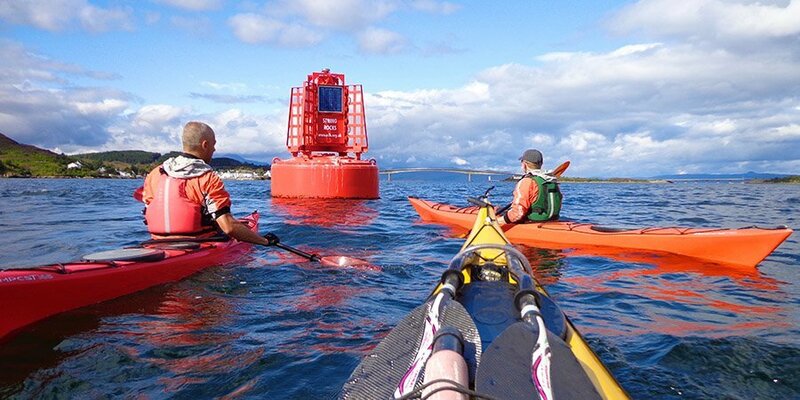 When we reached the point of Sleat we had gentle swell to practice in. 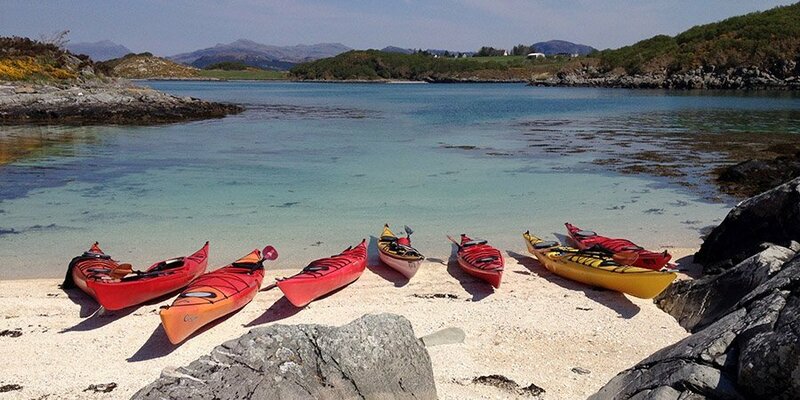 We headed across to Arisaig on one of our Skye Expeditions. No filters or tweaks to this photo … the sea really was this turquoise blue! Landing on a white sandy beach made it even more perfect. 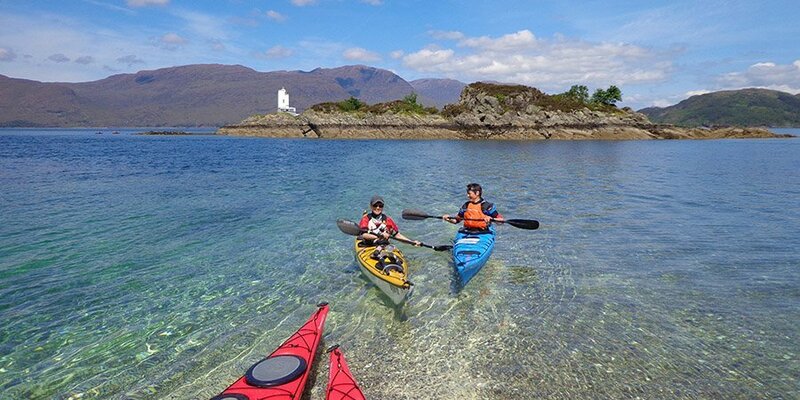 Drifting over crystal clear waters on a magical Isle of Skye Expedition. Three days kayaking and two nights wild camping. Such an adventure. 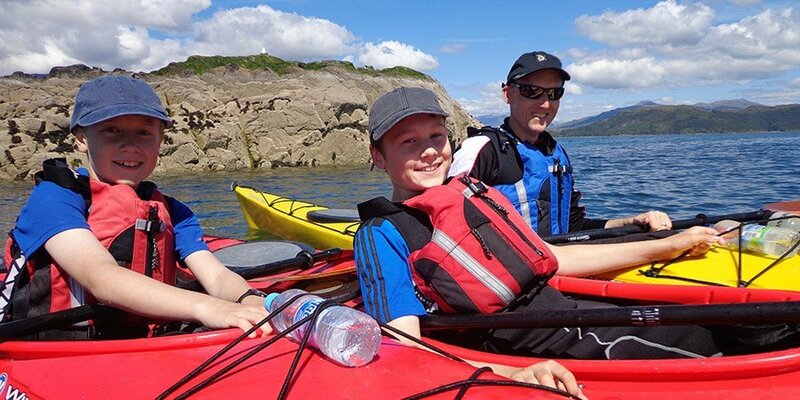 Peter and his family come kayaking with us whenever they come on holiday to Plockton. 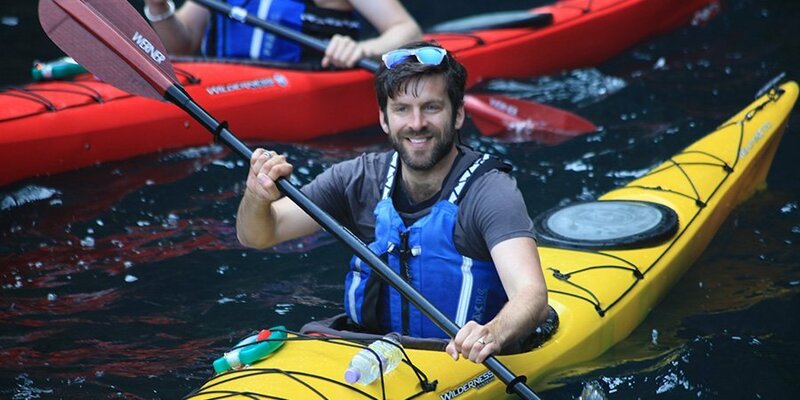 Lovely to see his children grow up … and their kayaking skills develop too. We look forward to your next visit! 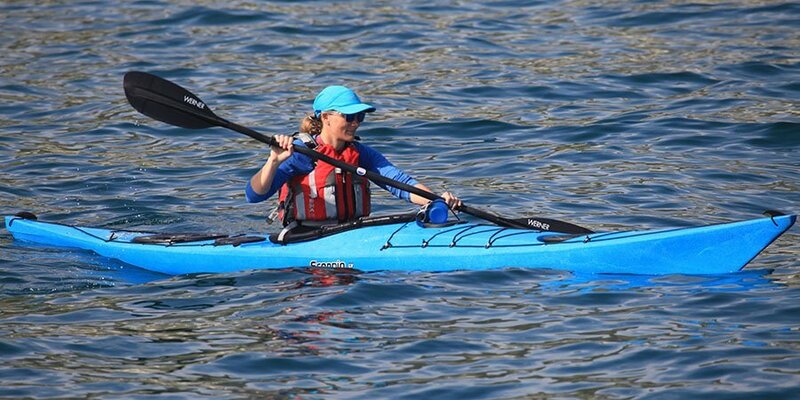 Spotting a seal from a kayak is such a treat. 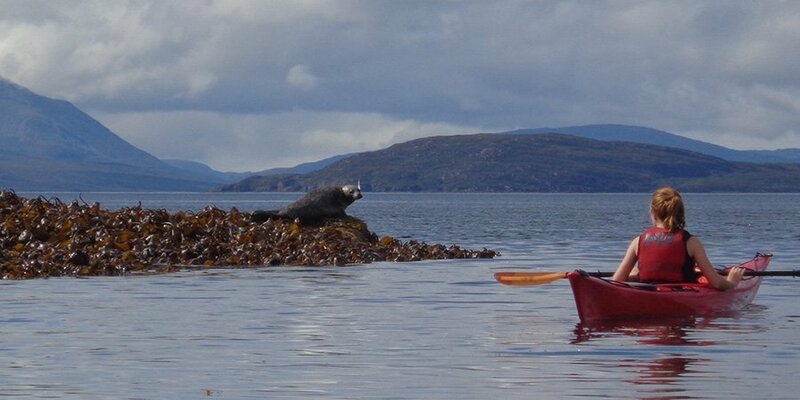 As we paddled around some rocks, just outside of Plockton, we suddenly found ourselves face to face with this seal basking on the kelp at low tide. Amazing to see them from water level. We kept paddling past so as not to disturb them. It then jumped into the water and followed us, and although very inquisitive it always kept a safe distance! 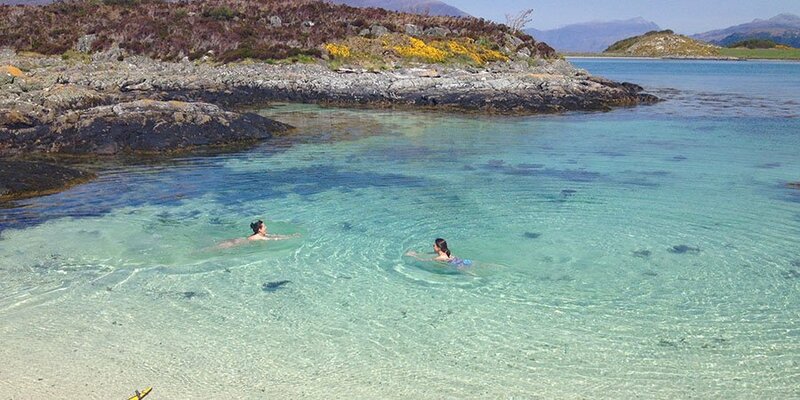 The coral beach near the Plockton lighthouse, made this the perfect lunch spot on a Learn to Sea Kayak day. Beautiful and warm and ideal for a picnic. 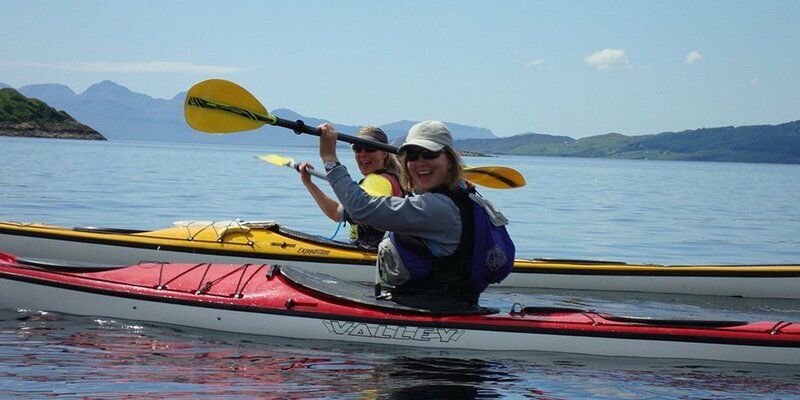 Instructors Alison French and Claire Knifton enjoying perfect conditions with their group of students learning to kayak. Lots of smiles on such a great day. Perfect weather and calm conditions for our group of complete beginners. 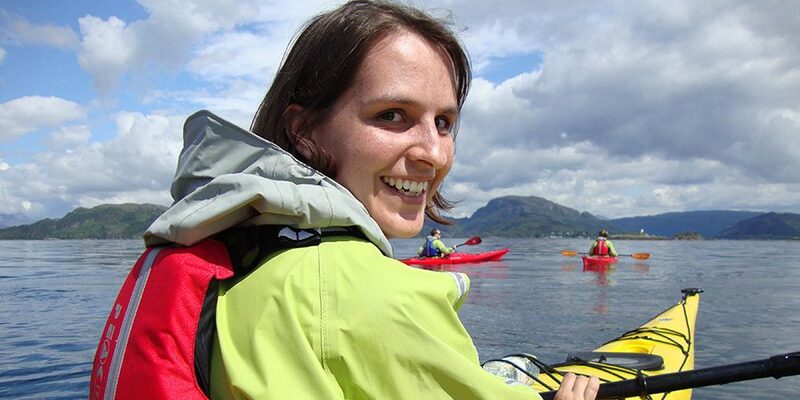 A fabulous day exploring the coastline around Plockton and then heading out see the seals basking on the rocks. 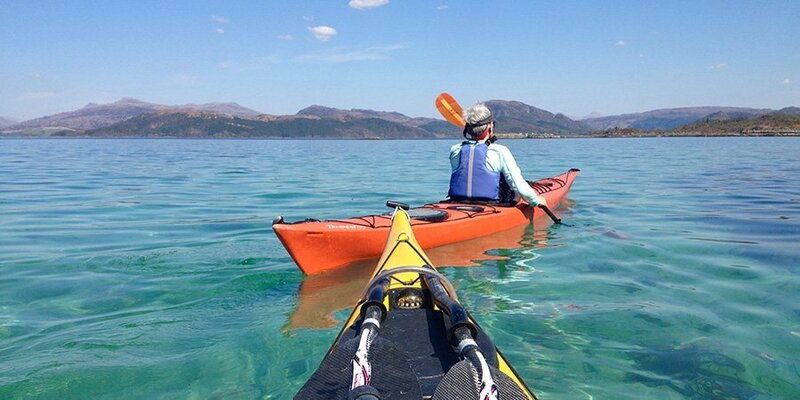 Learning to sea kayak when the water is this clear makes it feel like you’re paddling in the Caribbean! The coral beaches are bright white and full of shells. It feels like you’re on a desert island!